The EPMA (Electron Probe Microanalyzer) can provide quantitative and qualitative measurements of elemental composition at the 1-10 micrometer scale in solid polished samples. The method works best for inorganic solids that are stable under both vacuum and the electron beam, and which can be polished prior to analysis (see Preparation for details on sample preparation requirements). The EPMA can measure the concentrations of elements from C to U. Detection limits vary with both sample and analytical conditions, but are typically lower than 500 ppm (0.05 wt%). 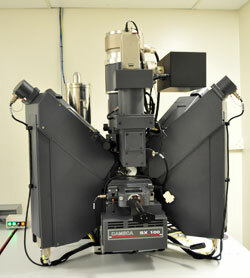 The laboratory has a large collection of reference materials for ensuring the accuracy of analyses. We have extensive experience serving customers from a range of disciplines (geology, chemistry, physics, chemical and materials engineering, pharmacy, pharmacology, etc.). We can work with you to design an analytical protocol that is optimal for analysis of your solid polished samples. 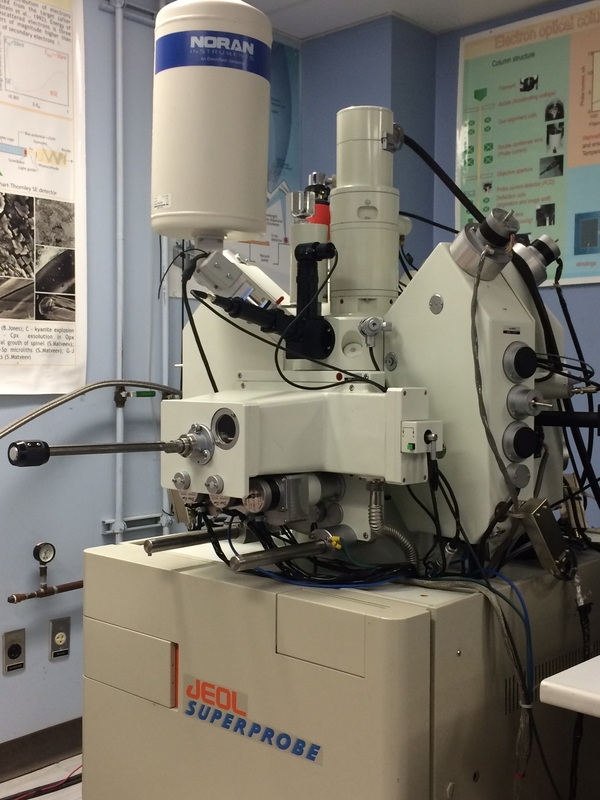 Our Electron Microprobe Laboratory is equipped with two electron microprobes the CAMECA SX100 and the JEOL 8900R. Each instrument features five wavelength dispersive spectrometers (WDS), and an energy dispersive spectrometer (EDS). A "cold finger" trap may be employed to reduce hydrocarbons in the chamber and enhance analysis of light elements (carbon and nitrogen). Secondary electron imaging and backscattered electron imaging. Note: EPMA is not used for analysis of fine powders (<40 micrometer diameter particles), liquids, or materials that are highly unstable under vacuum or the electron beam. EPMA is not optimal for bulk analysis and cannot measure isotopic compositions. Measurement of concentrations below 100 ppm, although possible, requires special analytical protocols; more sensitive analytical methods (such as LA-ICP-MS, SIMS) are available for such work.